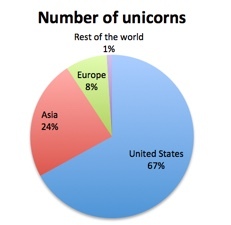 Musings on Markets: Billion-dollar Tech Babies: A Blessing of Unicorns or a Parcel of Hogs? Billion-dollar Tech Babies: A Blessing of Unicorns or a Parcel of Hogs? A unicorn is a magical beast, a horse-like, horned creature that is so rare, that even in mythology, you almost never run into a blessing of unicorns (which, I have learned is what a group of unicorns is called). It was perhaps the rarity (and magic) of private businesses with billion-dollar valuations that led Aileen Lee, founder of Cowboy Ventures, to call them unicorns, in 2013, but as their numbers increase by the month, it may be time to rename them after a species that is more common and less magical. 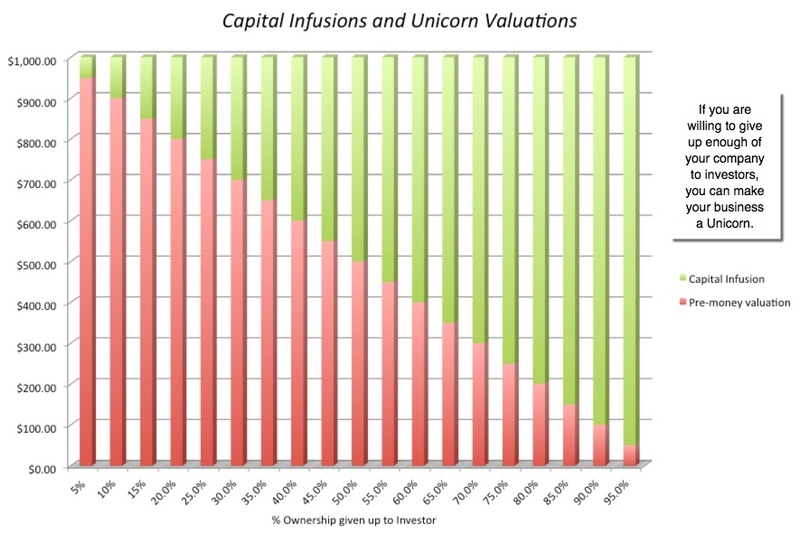 While there are several provocative questions that surround the rise of unicorns, this post is dedicated to a very specific question of how the investor protections that are offered to venture capitalists at the time of their investments can not only affect the measurement of value and make non-unicorns look like unicorns but also skew the behavior of both investors and owners. The explosion in the numbers of these companies has also given rise to almost as many explanations for the phenomena, some based on rationality and some on the prevalence of a bubble. 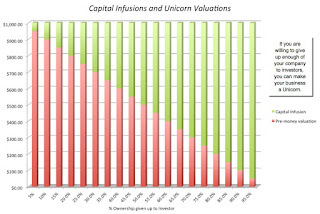 The rationality-based explanation for the surge in unicorns is that it has become easier to remain a private business, as private capital markets broaden and become more liquid, while it has become more costly to become a public company, with increased disclosure requirements and pressure from investors/analysts. The less benign argument is that investors are being driven by greed to push up the prices of young companies and that this has all the makings of a bubble. I think there is truth in both arguments and that you can have both good reasons for the increased number of large value private businesses and momentum driven froth in the market. However, I will leave that discussion to those who know more about these young companies than I do, and are more confident in their capacity to detect bubbles than I am. If the conventional definition of a unicorn is a private business with a valuation that exceeds a billion, how do you arrive at the valuation of such a business? While you have no share prices or market capitalizations for these companies, you can extrapolate to the values of private businesses, when they raise fresh capital from venture capitalists or private investors. Thus, if a venture capitalist invests $100 million in a company and gets 10% of the ownership in the company in return, we estimate a value of $1 billion for that company, making it a Unicorn. There are, however, two problems that get in the way of a good estimation. One is that the capital infusion changes the value of the company, creating a distinction between pre-money and post-money values. The other is that the investor's equity investment generally comes with bells and whistles, designed to protect the investor from downside risk and these protections can skew the value estimate. In an earlier post on the offers and counter offers that you see on Shark Tank, the show where entrepreneurs pitch business ideas and ask competing venture capitalists for money, I drew the distinction between pre and post money valuations. If the capital raised in an offering is held by the company, rather than used to pay down debt or owners's cashing out, the value of the company increases by the amount of the new capital raised, leading to the following distinction between pre-money and post-money values. In the example above (where an investor invests $100 million for 10% of a firm), the post-money value is $1 billion but the pre-money value is only $900 million. Thus, companies that are smaller than a billion can make themselves look like billion dollar companies, if they are willing to give up enough ownership in the company and can find investors with deep pockets. While it is unlikely that you will be able to find an investor to offer $950 million in capital for a business with a $50 million valuation, it does illustrate why post money valuations may not always be comparable across businesses. While the difference between pre and post money valuations is easy to handle, there is another aspect of venture capital investing that is more messy. Many venture capital investors are offered protection against downside risk on their investments, though the degree of protection can vary across deals. What type of protection? Consider the investor who invested $100 million to get 10% of the company in the example above. That investor's biggest risk is that the value of the business will drop and that investors in subsequent rounds of capital raising or in an initial public offering will be able to get much better deals for their investments. To protect against this loss, the investor may seek (and get) a provision that allows his or her ownership stake to be adjusted for the lower value. With full protection, for instance, if the value of the business drops to $500 million on a subsequent capital event, the original investor's ownership stake will be adjusted up to 20% (reflecting the lower value). This is termed a full ratchet. Alternatively, in the weighted-average approach, the original investor will receive partial protection, resulting in an ownership stake between 10% and 20% if the value drops to $500 million, depending on how the weighted average ownership stake is computed. The key, though, is that this provision is protection against a value drop, but only if the company seeks out capital, and is thus contingent on a capital event occurring. Probability of capital event: Since a capital event is the trigger for the protection, there will be no protection if no capital event occurs, a scenario that will unfold if the business unravels quickly. Put differently, the protection is useless if the business never raises any additional capital. (Since the probability of accessing new capital will decrease as the value of the business drops, especially if the drop occurs quickly, the option value is likely to be overstated. Expected time to capital event: The timing of the capital event may not be known with certainty, but to the extent that it can be forecast, you need an expected value. If the protection covers multiple capital events, it is the expected time to the last one. 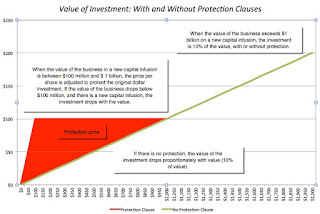 Degree of protection: Depending on how it is structured, the protection offered an investor can range from 100% (with full protection) of the dollar capital invested to less (with weighted average). Thus, the capital increase pushed up the value by $100 million and the investor protection clause served to inflate the unadjusted post-money valuation from $748.84 million to $ 1 billion. The greater the investor protection offered and the larger the amount of capital raised, the greater will be the disparity between the true value of the business and its perceived value (based on the transaction details). In the table below, I list out the percentage difference between the true value and the perceived value as a function of investor protection and business risk (captured in standard deviation). For a $100 million investment for 10% of a company, with a 90% chance of a capital event. Thus, if investors get 95% protection in a business where equity values have an annualized standard deviation of 70%, the true value of the business will be 21.54% lower than the perceived value (which is $ 1 billion, based on the $100 million investment for 10% of the firm). I know that I have simplified the complex world of venture capital deal-making in this example, and that allowing for more sophisticated protection mechanisms and multiple capital rounds will make it more difficult to estimate the protection value. However, this example delivers the general message that the more protections that are offered to investors at the time that they invest in young start-ups, the less dependable are the simple extrapolations of value (from capital invested and ownership stakes received). As an outsider with an interest in valuation, I find venture capital deals to be jaw-droppingly complex and not always intuitive, and I am not sure whether this is by design, or by accident. When it comes to investor protection, the stories that I read for the most part are framed as warnings to owners about "vulture capital" investors who will use these protection clauses to strip founders of their ownership rights. I think the story is a far more complex one, where both investors and owners see benefits in these arrangements, and where both can expose themselves to dangers, if they over reach. It is easy to see why private company investors like protections against downside risk, especially when investing in young start-ups, where valuation is difficult to do. However, there are three consideration that investors need to keep in mind, when deciding how much protection to seek. At a fair price, protection adds no value: In investing, you can, for the most part, buy protection agains the downside (in the form of insurance or put options), if you are willing to pay the right price. At a fair price, the protection delivers peace of mind but no additional value. In the example above, the prices that I computed for downside protection were fair prices and neither the investor nor the owner lose at that price. Thus, an investor can either invest $100 million, with no downside protection, and ask for 13.35% of the post-money value of $748.84 million, or get full downside protection and settle for 10.00% of the artificially inflated post-money value of $1 billion. Paper Protection: When investing in young start-ups with uncertain futures, the protection clauses in agreements often deliver far less than they promise. The anti-dilution provisions fail if the business you invest in never seeks out additional capital and the liquidation preferences that many investors add to their investments will not provide much respite when these young businesses are forced to liquidated, since their valuations tend to be heavily tilted towards human and idea capital. It should therefore come as no surprise that a significant portion of venture capital investments, promise and protection notwithstanding, yield little or nothing for investors. At the risk of offending some of my readers, I would argue that the protection clauses in most venture capital investments have more in common with the rhythm approach for birth control, a hit-or-miss system that delivers big surprises, than with full-fledged contraception. Abdication of valuation responsibilities: Venture capitalists who view building in protection against the downside as an alternative to making valuation judgments are seeking false security. As an investor, if I were asked to choose between investing with a venture capitalist who makes good valuation judgments but is not adept at building in downside protection or with a venture capitalist who is superb at building in downside protection but haphazard about valuation judgments, I would pick the venture capitalist who makes good valuation judgments every single time. There is also the very real concern is that some venture capitalists who believe that they are protected from downside risk (even if that belief is misplaced) may be inclined to take reckless risks in investing. There are three benefits to founders and entrepreneurs from granting protection to investors. The first is that they allow them to raise capital in circumstances where its might not otherwise have been feasible. The second is that granting these protections may give the founders/owners more freedom to run the businesses as they see fit, without constant investor oversight. The third is that it allows for inflated valuations, as illustrated in the example above, that can then yield either bragging rights or access to more capital. The costs are equally clear. If owners give away too much of the firm for bragging rights, they will be worse off. In the example above, for instance, where we estimated the value of protection to be approximately $25.12 million, giving the investors more than 10% of the unadjusted post-money value of the business in return for $100 million in capital invested would be giving up too much. This cost is exacerbated by a behavioral quirk, which is that the founder owners of a business often tend to be far more confident about its future success than the facts merit. The same over confidence and faith that makes them successful entrepreneurs also will lead you to under price the investor protections that they are giving away in return for capital. While public market investors may view these arrangements between venture capital investors and founder owners as an inside-VC game, they can be sucked into the game in one of two ways. The first is when public market investors are drawn to invest in private businesses, drawn by the allure of high returns (and not wanting to be left out). The second is when private businesses go public and investors are trying to estimate a fair price to pay for the offered shares. In both cases, it is natural to look at the post-money valuations that emerge from prior capital rounds and use those values as anchors in determining fair prices to pay. After all, not only are these real transactions (rather than abstract valuations), but the assumption is that the venture capitalists who were able to invest in these rounds must be smarter and better-informed than the rest of us. I think that both assumptions are shaky, the first because the structuring of the transaction (with investor protection and capital infusion) affecting the observed post-money valuations and the second because any investor group (no matter how savvy it might be) is capable of becoming irrationally exuberant. Investors can take the first steps in protecting themselves by doing their homework. A private company that is planning on going public has to reveal the details of protective clauses and other carry overs from prior capital rounds in its prospectus. Be real: Both sides would be well served by reality checks. Investors have to be recognize that the protection they are getting is porous and contingent on capital raising events and owners have to realize that offering these protections may alter how and when they raise additional capital, perhaps to the detriment of their businesses. Keep it simple: The only people who gain from complexity are lawyers, accountants and consultants. I may be missing the historical context here, but I think that there are far simpler ways of building in protection than the standards that exist today. For instance, rather than continuing with the practice of adjusting price per share for dilution, which is the practice today, I think it would be far simpler to write the protection in terms of dollar capital invested. 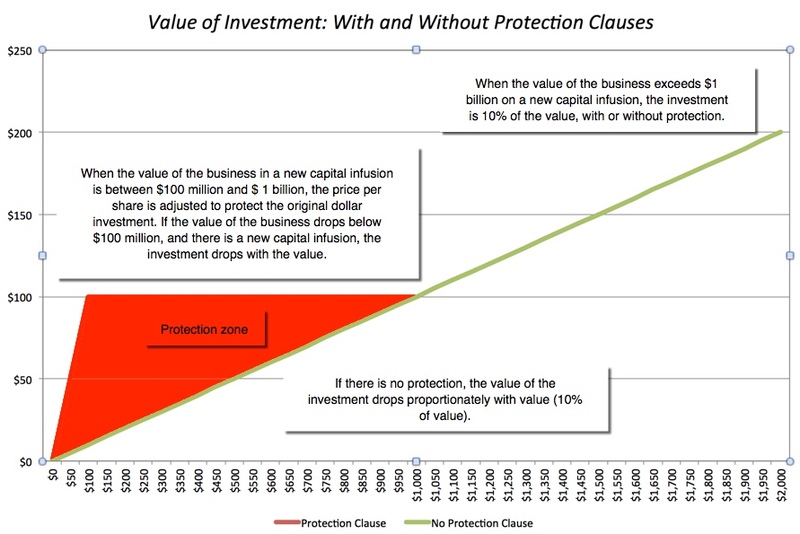 Check the price of protection: At the right price, protection creates value for neither investors nor founder owners. If the protection is priced too high, with the investor settling for a far smaller percentage of the unadjusted value than he or she should, it is not worth it. If the protection is priced too low, founder owners are giving up too much of their businesses in return for the capital raised. Don't forget your fundamentals: While the presence or absence of protection may make a difference in marginal investments, it should not fundamental change the businesses you invest in, if you are investor, or how you run your business, if you are an owner. Thus, if investors use the presence of downside protection as a reason for investing in over valued businesses, they will lose out in the end. (And making that investment convertible and calling it preferred will not make it a good investment.) By the same token, founders who give away much larger percentages of their businesses than they should, to pump up post-money valuations, will regret that decision in good times, and even more so in bad times. Pretend I've invested $950mm in a company with $50mm in value (and $500mm is the value of the downside protection). Then the company has had a post money Enterprise Value of $1bn, while the equity value is only $500mm. The remainder of the value is an implicit security issued by the company to the investor. Theoretically, the pro forma ownership would then be based on $50/$500mm and $450/$500mm. The remaining value has just been "purchased" by the investor. fantastic - It's is indeed a new perspective to valuation - the value of all the bells and whistles. i would also urge you to think about how to value drags and tags and "syndication" (that allows for multiple investors to be be treated as one or separate depending upon what the situation demands). This has the effect of offering chunks of liquidity at one go and also has the downside of a stranded whale should liquidity reverse (if liquidity dries up or the business model has serious risks - then exit becomes difficult). I am starting to visualize VCs as "fuel tank" providers (who fill in entire tank fuls of fuel and attach themselves to the vehicle) as opposed to public markets that only fill fuel to an existing tank. Oversimplification may be, but I am not able to fathom how this will affect liqudity/exit dyanmics and hence valuation - since this entire process is reflexive. I’m going to start with a basic assumption that this only really matters for the middle 60% of cases. 10-20% will continue to grow magnificently that never needs downside protection, and another 20-30% will fail beyond the coverage of the downside protection. With that being said I think there are some advantages to these forms of downside protection that are worth mentioning. o Trying to get an accurate handle on valuation is difficult where the business model is still “fluid”. In some cases it is just easier for everyone to swallow to give the new investor downside protection. • Founders have believed in their business since the beginning. Therefore, selling downside protection is much more palpable then taking any further dilution given the cash-requirement to get to the next stage is relatively fixed. I think your last paragraph sums it all, because that is the only thing that matters. We cannot do any predictions, and if we do we fail in that anyway. In investing what works is analyzing value against price, and if price is right it will yield returns. VC or anyone who is interested in investing should do just that. Most of these guys, however, do speculation. When both capital seekers and capital suppliers get into speculation game, whoever has the gift of the gab would win momentarily. In the end, business profits would determine value of the business. Consistent profits from VC investment is a myth because they are big time speculators. This seems to be proven by that article you linked from WSJ. "assume further that there is a 90% chance of the IPO occurring in one year." Is this a realistic assumption? 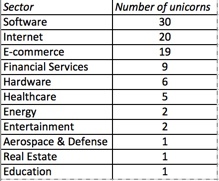 To the contrary, it appears that most unicorns are less likely to go public in the next year (or even years). I am currently going through your course slides and questions (session 7 - Estimating cash flows) and question 5 deals with calculating net capex. The issue I am having is that issuing shares to pay for acquisitions shouldn't included as part of net capex that goes into FCFF calculation should it? Obviously it would dilute your FCFE as there would be more shares outstanding but I don't understand the rationale behind including share issuance for acquisition to be included in net capex calc for FCFF. Not sure if this is right forum to ask! Just curious on whether there are any new company valuations in the horizon? Your insight and journey through Yahoo, Vale and Lukoil recently have been ver interesting. One comment- In the section titled ‘Investor Optionality’ you have rightly attempted to unbundle the fundamental value of the business and the value of the put option. However, it appears to me that principle has not been fully captured in the pre-money computation. To elaborate, in your illustration, out of the total investment of US100mn, US$25.116mn is for the value of the put option. Thus, only the remaining amount of US$74.884mn represents an investment to acquire a 10% stake in the business. Consequently, in my view, the pre-money valuation in the instant case should be USD748.84mn less US$74.884 i.e. 673.9556mn instead of $648.84mn. Would like to hear you views Mr. Damodaran. what's your take on the recent crash in Chinese market? I am amazed to know that 80%-85% of the total market participant comprise of the retail investor who are likely to be non diversified & which obviously explains the 150% rally in the current year.so when the economy is growing at 7% its mathematically impossible to explain where the market where but then why have no one have questioned the big valuation gap between intrinsic value & market price isn't it like 2000 Tech bubble kind of scenario.I really want to know why it always takes so long for the market to come to their senses, aren't this market covered by Analyst, haven't they taken lessons out from other market crash what's the missing link.Is it because pricing is more prevalent than valuing? Well now the Chinese Govt intervening by changing the rules of the game in the middle of the game which appear to be adding fuel to fire by suspending trading of 1200 companies ,asking brokerage house to buy shares & prohibiting major share holder by suspending trading for 6 months. do you think such measure would save the day? what would be the near and long term consequence it terms Risk premium ,credibility of market,Investor confidence .